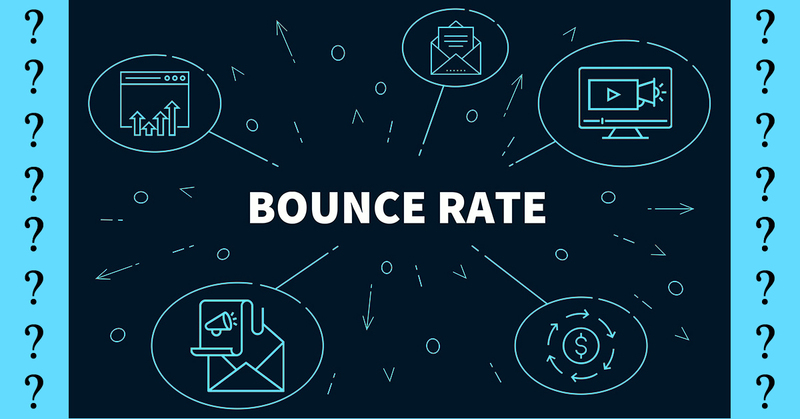 Understanding Bounce Rates | LunaGraphica, Inc.
Before we get too far into unraveling the mysteries of your website’s bounce rate, we should probably explain what a bounce rate is and what it means for your site. When someone “bounces” from your website, they are arriving and leaving before looking at anything other than the page they landed on. This can mean they are clicking back to get out of your site and go on to other search results, typing a different url in their address bars to leave, or simply closing the tab your site opened on. No matter how they are doing it, the important piece of information is that they are leaving without seeing the information you want to give them. Why does this matter? Well, obviously you don’t want people leaving your website like they are running from a burning building… But beyond that, your bounce rate has much bigger implications for your website’s ranking on Google. Ultimately, having a high bounce rate means Google ranks your site lower in search results, which means fewer people will reach it. Bummer, right? This answer isn’t necessarily as straightforward as you might think. The big answer is that it depends on what kind of site you have and the pages within that site. For instance, landing pages with a simple call to action will always have a higher bounce rate than FAQ pages, and service sites typically have lower bounce rates than retail sites. But on average a bounce rate under 40% is great and anything above 50% is worrisome. Obviously the higher that rate goes, the more concerned you should be. Before moving on, we should also point out that an unusually low bounce rate isn’t good either (below 20%). More often than not, this indicates an issue with your analytics execution that will need to be fixed to ensure you are receiving accurate information about your site. Luckily in most cases high bounce rates are relatively easy to improve (unless you’re in the 80s and 90s… at these rates you should be seriously considering a complete site redesign). Google Analytics can tell you things like which pages on your site people are bouncing from the most, and what kind of viewing devices have higher bounce rates, but it is up to you to examine the data Google provides and formulate a plan to improve your website’s bounce rate. Thankfully, the solution can usually be narrowed down to addressing few common issues. Honestly, how many times have you found yourself waiting for a page to load only to become frustrated and move on to another site? There are many things that can slow down load times on web pages. Is your site optimized for mobile viewing? If you’re mobile device bounce rate is high, this is most likely an issue you need to look into. Do you have a lot of pop-ups on your site? Do you have music or videos set to auto play on your home page? How about animated gifs? All of these things slow load times, beyond that, they just annoying to most people. Ask yourself what irritates you about other website and avoid those things on your own site. Are your tags and descriptors accurately representing your website? Whether we are talking tags on blog posts, or meta tags in your site’s code, these are very important in helping your site reach your target market. No one intentionally misrepresents this information (well… maybe some click bait sites do), but occasionally the wording you have used may not be exactly what you need. Comb through your site and make sure you have set keywords, tags, and descriptions appropriately. Get some fresh eyes on them; you may be missing something that would stand out to others. The bottom line is that unless you are making it easy for your target market to find you, you will get lost in this great big World Wide Web. Is your site easy to navigate? Sometimes confusing navigation drives users away from websites. If you have a bunch of dropdown menus with sub-menus upon sub-menus, this could be what is causing your site’s high bounce rates. Consider consolidation related information on one page. You can even lead viewers to other pages through internal links, rather than through your sites main navigation (more on internal links in a few). Your website’s main navigation should be as straightforward and minimal as possible. You want your audience to find the information you are providing right away. If your navigation menu is a jumbled mess you are likely to lose viewers to simpler, cleaner sites. Ask yourself what you want viewers to do on your wesbite; is your navigation making it easy for them to do those things? One of the easiest ways to get viewers to stay on your page is by leading them to more information on your site. If you want your audience to stick around, show them to other parts of your site with internal links. If you have a blog, link your related content in blog posts. If you are selling a product, link to related products (think Amazon’s “people who purchased this, often purchase this” links). You can even utilize related content modules to help you do this. Ask yourself if one product, service, or subject featured on your website is related to any others and link them to each other. This will be sure to keep your audience interested in what you have to offer on your website. This seems like a marketing “no-brainer” but sometimes knowing who your audience is, and how to communicate with your audience are different things. Pay attention to the content on the pages with the highest bounce rates; is it really speaking to the people your products or services are being marketed to? For example, if you are doing things like using current pop culture references when you’re marketing to the baby boomer generation, you may want to learn more about what speaks to your market. You have presumably done market research to determine what your target market wants; make sure you know how to give it to them. Is your website sending the appropriate message to the right group of people? Lastly, look at the pages on your site with the lowest/best bounce rates and repeat what you are doing there. What are your top viewed pages? Which blog posts are getting the most hits on your site? Do more of what people like about your website. Furthermore, know when something isn’t working. If you have a specific page that is getting more bounces than others, figure out what makes it different and change that. As long as you are giving your audience what they need, they are going to be happy. Does all of this sound daunting? Don’t worry, that is why we are here! Our developers and designers are fully versed in Search Engine Optimization and are waiting to make your website a success story. Get and estimate now!